The Micro Lantern uses a specially designed conical reflector and a bright Nichia 5 mm LED to illuminate everything within a 6.5' (2 m) diameter. 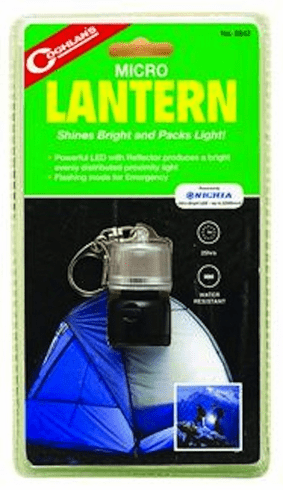 It's the perfect tent or walking lantern and it fits in the palm of your hand. Water resistant with a positive feel rubber On/Off button and flashing mode for emergencies. Attaches to your pack or jacket for the ultimate in portable light. Size: 2" (5 cm). Battery Life: 25 hours/50 hours flashing.